Spoiler alert: Jack Pearson died in the Feb. 4 episode of NBC’s hit show, “This is Us.” His death was foreshadowed in the first season, but now we finally know how the house fire was sparked, how the family escaped, and how Jack died. Be warned, if you haven’t seen the episode yet, there are more spoilers ahead. However, the episode also gave us some critical fire safety reminders. 1. 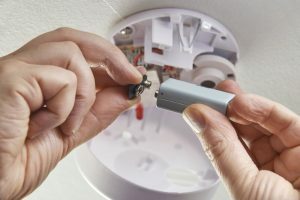 Keep extra smoke detector batteries on hand, and test them. Several episodes prior to the actual house fire, we caught a glimpse of a smoke detector near the kitchen lacking batteries. Apparently, it was on Jack’s to-do list to pick some up and replace them, but it appears that never happened. In the house fire episode, no smoke alarms are sounding. The fire sparked in the kitchen, and without a working smoke alarm nearby, consumed most of the house before the family awoke. The lesson here: keep extra smoke detector batteries on hand. Toss a pack in your cart when you pass the rack at Target or the grocery store. Or, invest in the newer smoke detectors that has a battery that lasts 10 years. No matter which route you go, it’s also equally critical to test you alarms regularly. The best advice here is to test them whenever there is a time change … so twice a year. Of course, it wouldn’t hurt to test them more often than that if you choose! 2. Have a well-planned escape plan. It’s very important to have a well-planned (but not over complicated) fire escape plan that your whole family knows and understands. This should include two ways to exit each room. In this traumatic episode of This Is Us, Jack runs across the hall to get Kate from her room and instead of going out the window (which he says is too high), he uses a mattress to shield them from the flames as he tries to gather the whole family into the same bedroom. However, in this process, the mattress catches fire and Jack burns his hands. Trying to fight their way through the flames was a very dangerous move, and every minute counts when there is a fire. Since the window was Kate’s alternate way out, consider purchasing an emergency ladder that can hook to a window sill. At 17 years old, had the Pearson family had a fire escape plan in place, Kate would have known when she woke up to flames outside her bedroom to use that ladder to leave her room safely. From there, she could have reunited with the family at a designated area near the street, away from the house. 3. Pay attention to finicky appliances. This fire was sparked by an old crock pot with a malfunctioning on/off switch. While Jack did make sure to turn the crock pot off before going to bed, it turned back on itself because it was also left plugged in. If you have old appliances that seem to malfunction, get rid of them – or at the very least, unplug them when you’re done. 4. Don’t go back into the house. 5.“Stuff” is replaceable; people are not. This is kind of rehashing the last point, but when Jack is sitting in the ambulance outside the burning home, Rebecca makes the wise statement to her kids that it’s “just a house.” While I’m sure none of that really think our home is “just a house”, there are very highly skilled restoration companies in your area that can return your home to how it was before the fire. 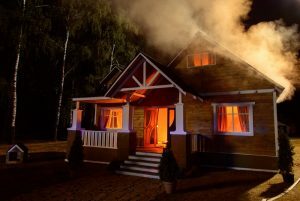 So, in the event of a house fire, victims are more likely to die from smoke inhalation before being overtaken by the flames. Once you and your family are out of the house, do not go back in – no matter what. Let the firefighters handle it. Possessions can be replaced; people cannot. Once your family is safe and the fire department has the situation under control, one call to A&J Property Restoration DKI, your preferred local restoration contractor can get things in motion to getting your family back home as soon as possible. Our staff at A&J Property Restoration DKI is fully trained in emergency fire and water damage restoration services for your home, business, and structures. Fire and smoke damage can be extremely messy. Cleaning the fire damage or smoke damage, removing odors, and cleaning your personal belongings or contents is what we specialize in. Let us help you get back on your feet as quickly as possible and return your home or business to its pre-loss condition – with our emergency fire and water restoration.